You’m only jealous ‘cus you ‘ent got any! In Spring 1932 at Stow-in-the-Wold, Sarah married farm worker George Bickley, son of Edward and Jane Bickley of Westington Chipping Campden. The couple lived for many years at The Bank, Broad Campden, but they had no children. Now what ‘e wunt a gew and do that fer? How many women in the audience that evening would have ‘swooned’ at the thought of being singled out by their idol? 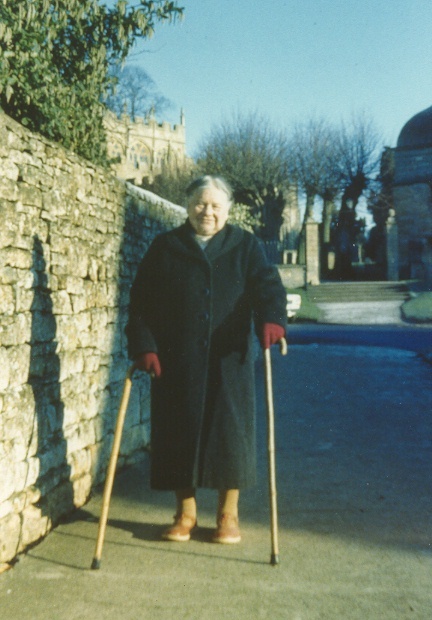 The couple moved to the Almshouses in Chipping Campden just two years before George’s death, and Sarah lived on there for a further six years. The delightful, eternally cheerful Sarah was a shining example of a genuine countrywoman, totally lacking in pretention, at ease with herself, undemanding, unimpressed with fame and fortune, reflecting to an extent the very character of Campden itself. To actors whose professional life required them to play a part, Sarah must have been a refreshingly honest breath of pure Cotswold air.